Signs obscure the landscape wherever you go. But have you noticed that some of them are exceedingly strange and funny? 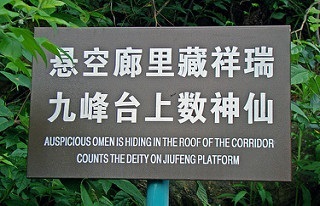 I have found examples of strange and funny, even weird, signs all around the world that I want to share with you. Take a look at the photo of the STOP sign to the right. Is there something slightly askew about it? I found this upside down STOP sign right in my own back yard in Rogers Park, a suburb of Chicago, Illinois where I once lived many moons ago. But the U.S. does not have a monopoly on funny signs. Read on for a look and a laugh at some of the funniest signs I have seen. 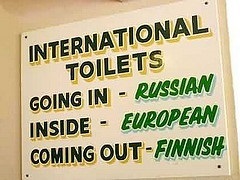 This clever, one-of-a-kind toilet sign applies to several ethnic populations and can be seen in Devon, United Kingdom. 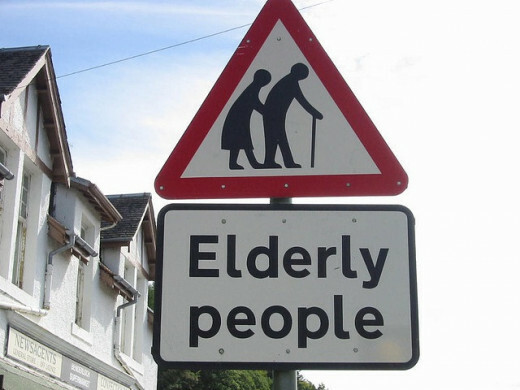 How about this far-from-PC sign warning you about the presence of senior citizens which can also be found in the United Kingdom. Answer: Boring is a metropolis of approximately 8,000 folks. Fun Fact: In 2012, the town of Boring in Oregon was paired as a sister city to the town of Dull in Scotland (population 84). True! To admire this interesting No Trespassing sign in person, you must travel to Edinburgh, Scotland. 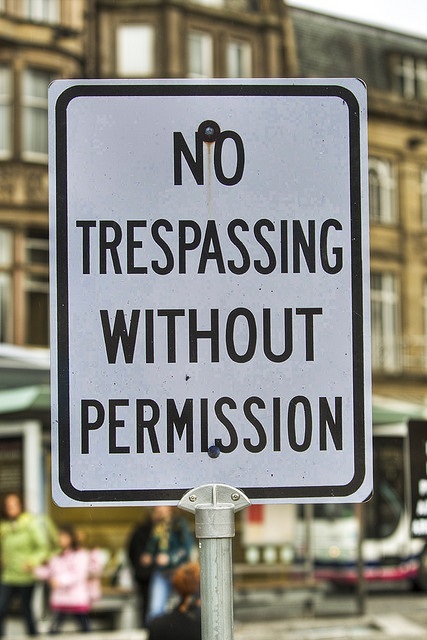 As I understand the concept, 'No Trespassing' means do not trespass (without incurring some sort of dire consequences). Right? So ... if you are given permission as the sign indicates, are you still trespassing? Just wonderin'. Speaking of trespassing . 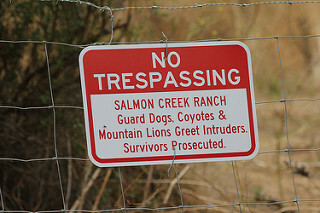 . . the No Trespassing sign on Salmon Creek Ranch, Sonoma County, California is a bit more specific regarding potential consequences. The 'mountain lion' threat would get my immediate attention. "You are under arrest for trespassing." . . . "On what grounds?" Whenever I have a few extra hours in any foreign city on a weekend, I look for the largest local flea market. Do you like to shop in foreign flea markets? 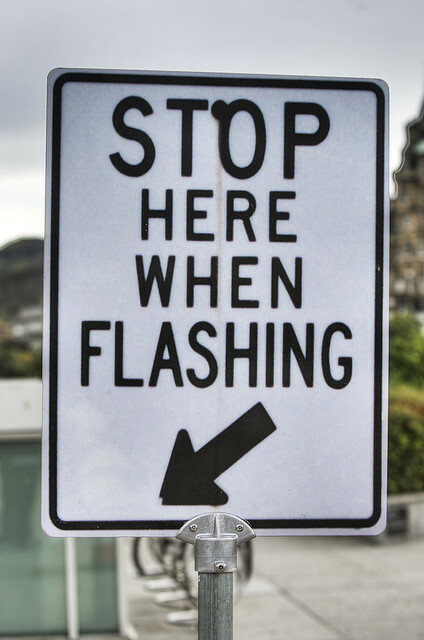 Then this sign in the city of Gothenburg, Sweden might easily draw you in. Although I admit it did take me a few moments for the meaning to sink in. 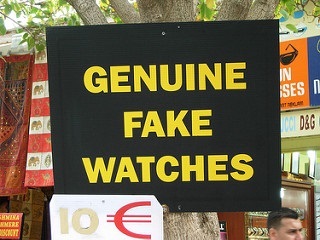 Then again, faux and replica might not be that easily understood by the local populace. This simple, silly sign I have not personally observed, but somewhere in Canada, I am told, you will find the 'Sharp Edges' sign. Back to Edinburgh, Scotland again for the pedestrian caution sign. Obviously, you cannot be too careful when driving in that city because of those dang slippery pedestrians everywhere. You can find this sign in Stockholm, Sweden. Yes, the message is ambiguous. Does it refer to the sign itself flashing? Doubtful since there are no lights visible to flash. Does it represent an invitation for perversion? Have there been incidents of less-than-sentient citizens who were driven to perform this act? Now help me out with this final image. The sign, printed in Chinese characters, can be found in Taizhou, Zhejiang, China. Copyright BJ Rakow, Ph.D. 2015. All rights reserved. Author, "Much of What You Know about Job Search Just Ain't So." Thank you for your kind comment. My loving Mom B.J. passed away in February of this year. She was an incredible writer with the best sense of humor of anyone that I have ever known. I got some good laughs from this one, Coach. I miss seeing you about since you know who shut it's doors. Me and several others are not writing on mylot although the pay is nothing like what we experiences with the bubble factory. 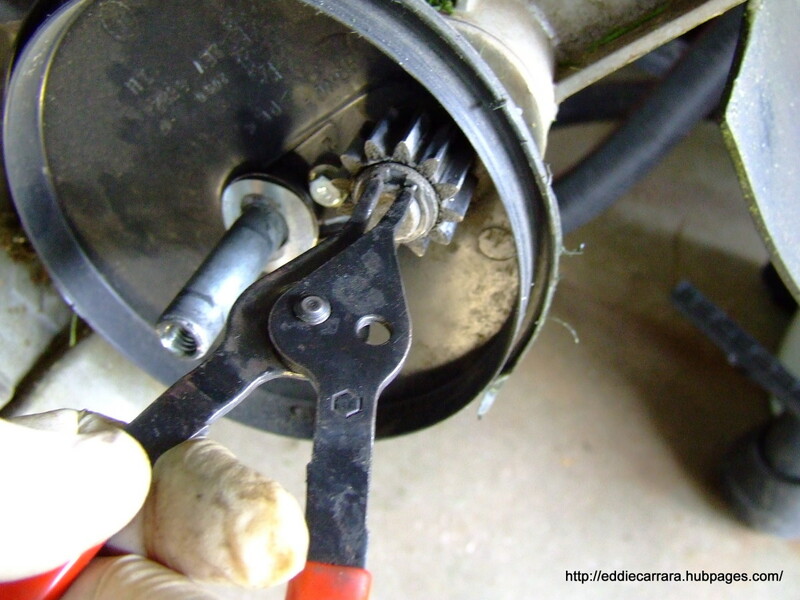 I need to get more hubs written especially ones I did that were tutorials on bubs, but time is limited at present. Just got a payment from this place so I thought I should pay it a visit. Who is Sherry, might I ask? I love these signs....I never have my camera ready when I see one, doggone it. You made me smile! Best for 16! That was a Gotcha for me, Yoleen. Thanks for sharing it. 'No pets,' indeed! Mahalo for the return visits, m'dear. Hi, Devika - how nice to hear from you all the way from Dubrovnik - which I once visited back in the 80s - a beautiful town with friendly inhabitants. Thanks for finding this awesome. And a very Happy New Year to you, too. Hi, Yoleen. So reading about the town of Pee Pee pissed the Sh!to out of you? Thanks for the funny comment, m'dear, could not have said it better myself. Heheh..nice bunch of silly signs, drbj. I noticed one last year in front of the local hospital. It was in a designated smoking area, away from the building. It reads: "Smoking Area Only". I guess you can't hang around there, unless you're smoking...or the staff decided that 'designated' was one of them thar big words. Someone came up to a glass door with a sign that said, "step on". He stepped on the mat before it; nothing happened. He pulled open the door and entered the building, then looked at the door. The sign now said, " no pets". Awesome write and presented so well with the signs. A Happy New Year to you! Yes, I read that hub. It pi$$ed the $hito out of me. LOL! Delighted that I enlarged your perception of funny signs while walking in the future. Don't forget, Alicia, to let me know of any winners you find! Thanks for finding this as funny as I do and a very Happy New Year, m'dear. Makes you wonder what folks were thinking. Then again the whole world today makes me think that! Have a very Happy New Year, m'dear. Hi, Jodah. Thanks for chuckling and loving these silly signs as I do. 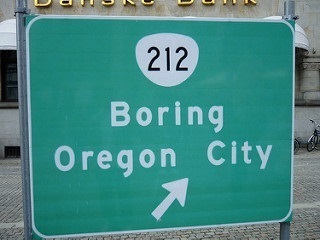 The sister cities of Boring and Dull were obviously made for each other. 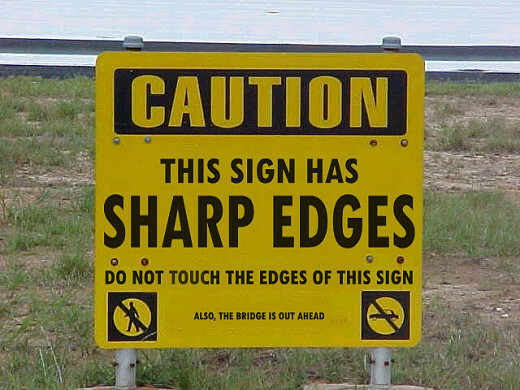 The 'Sharp Edges' sign is one of my favorites, too. Wonder if that Canadian bridge was ever repaired? Happy, Healthy New Year to you and your family. Hi, Yoleen. Yes, indeedy, Weed and College go together like love and marriage. Thanks for pointing out that funny sign in northern CA. Here's wishing you a very Happy New Year. Thanks for the visit and the kind comments. May your New Year be the happiest. Hi, Ruby. I miss Carlin, too, he was a funny guy. Maybe I'll interview him one day - one way or another. Flea markets are my passion, too, especially when I encounter a new one in a foreign country. That photo you found is definitely a find. 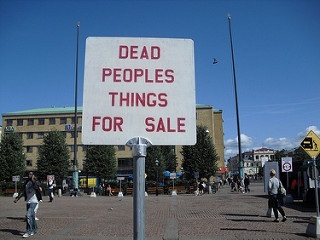 Delighted you enjoyed this hub and the 'dead peoples things' sign. 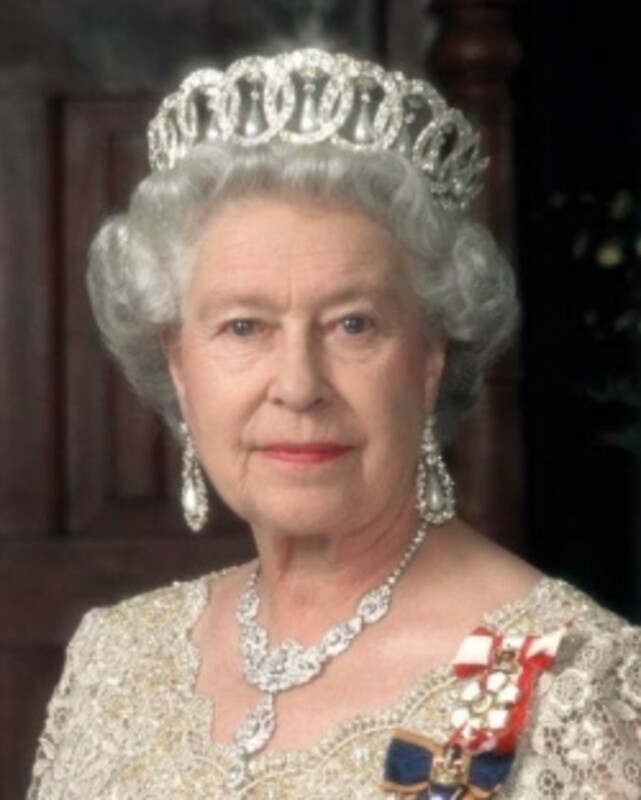 A very Happy, Healthy New Year to you, m'dear. Now remember, Victoria, that's a promise. When you are out, watch for funny signs - they are everywhere. You are most welcome for the hub; thank you for the chuckle, and Happy New Year. Since Boring is a sister city to Dull (Scotland), you may have a valid point, Chantelle. Also, billybuc wrote that he has been there and it is. Boring! Thanks for stopping by and a very Happy New Year, m'dear. Jasmeetk - nice to meet you. Yes, those Scottish pedestrians are most slippery when wet. "Watch for icing on bridges," That one belongs in this series, too. Hope your New Year is healthy and happy, m'dear. Great comment, Eric, you really covered the bases and you made me laugh! Thanks for finding this fun - entirely my pleasure. Happy New Year! Happy New Year to you and Bev - may this be your best year ever. Another funny sign is one on Hwy 50 near Ebbets Pass on the way to Lake Tahoe. It says, "Eat at Pow Wow and get gas". This is very funny, drbj. I'll be looking out for funny signs on my walks now that I've read thîs! There is a sign in front of a commercial garage that encourages people to park right in front of the doors because the employees drive through walls! I love these drbj..still chuckling. It's great how Boring and Dull became sister cities though. Wow, that sign with sharp edges got me...pity about the bridge up ahead. How about the one on Interstate 5 in Northern California, with "Weed" in one direction and "College" pointing in the other? In many cases, can't both be found in the same place??? I've came across some pretty funny signs in my day, and I always keep my eyes open for them. 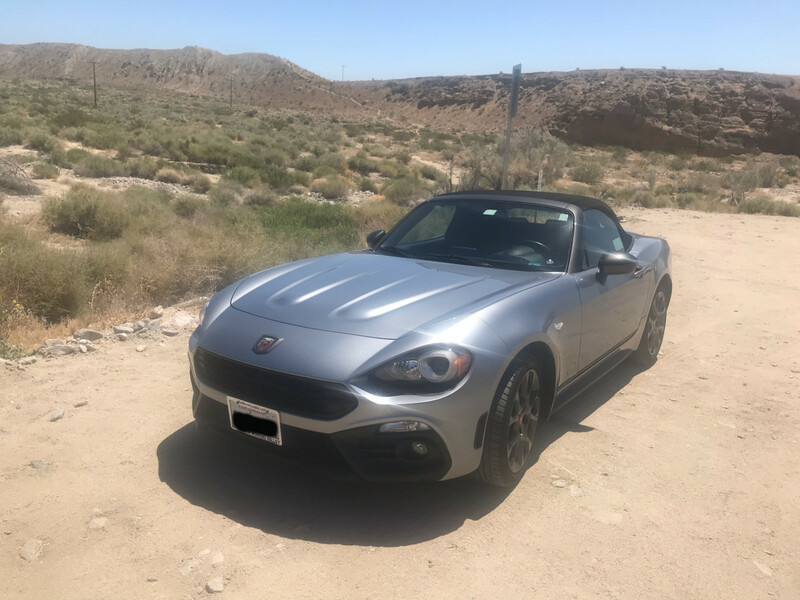 In one of my blogs I pointed out the stupidity of pointing out to people that a guardrail is damaged, seeing as we don't plan on hitting them, lol. Another funny one to me, I once saw a large billboard promoting a convenience store's "Free bathroom tours!" Funny stuff! Sitting on the toilet eating a chocolate candy bar. lol. I miss George. You mentioned one of my most fun things to do, flea markets. I found a treasure in Fl., a picture of Rhett and Scarlett, my favorite movie! " Dead peoples things for sale " Tops ' em ' all. lol. Oh, I love these! I love seeing stuff like this out in public. I can't think of anything local that I've noticed, but now I'll be watching more carefully. Thanks for the hub! It made me chuckle. I've never been to Oregon but if I lived in Boring I'd either move or petition the city council to change the town's name! 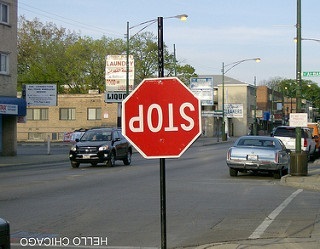 Your stop sign reminded me that if you read the railroad crossing warning sign backwards it says,"nestil & kool pots". Great silliness. Love 'em all! Our state got over its silliness when it got rid of its signs that read "Watch for icing on bridges". Pranksters would call the highway department and say "why, is it made of cake?" I am just slippery enough to stop and flash. Trouble is I look more like those elderly folk. Excellent fun article. Thank you. What a great way to begin my day. I'll be laughing all morning over a couple of these...and by the way, I've been to Boring, Oregon and yep, you guessed it....BORING!!!!!! !